Middle East Forum director Gregg Roman appeared on Cornerstone Television with Donald Black, the station's CEO and president, on December 14 to discuss social media and Islamic radicalization. See video at right. We heard a few months ago about these attacks on Jewish citizens, kind of random attacks, people stabbing people randomly. Give us an update on that. This is what's being called the Facebook Intifada. It is individuals and terror organizations in Gaza and in the West Bank, but also other places in the Arab world ... that are trying to take social networks, put their hate on Facebook pages and Twitter feeds, and radicalize and encourage youths. Anywhere from the age of 11 – 11 years old was the youngest perpetrator of a knife attack on innocent Israeli civilians – all the way up to someone who's 40 or 50 years-old. Women, men, teenage girls, teenage boys, are all having access to this information. It's very hard for Israeli security authorities to stop them. In the past, you could shut down a radio station that was broadcasting incitement; you could get to the source of where the hate was coming from. But now, with [terrorists operating in] virtual cells[s], as opposed to on the ground, you can have an attack take place anywhere and any time. But because the Israeli security forces have been able to adapt to it, they've been able to mitigate some of the damage that has come across, including an attack this morning. 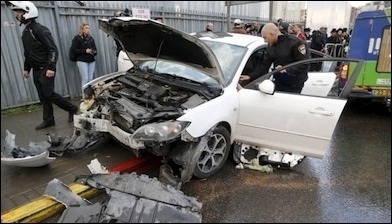 An axe-wielding Palestinian man rammed his car into an Israeli bus stop on December 14, injuring at least 11 people. There was. An East Jerusalem man, a Palestinian from East Jerusalem, 21 years old, driving a white Mazda, was coming up the main highway into Jerusalem, veered across four lanes, and hit a bus station full of civilians, including an 18-month-old baby who is now in critical condition in the hospital. Because the Israeli security forces have gotten used to this, before the man was able to get out of his car – he had an axe with him – he was neutralized before he was able to cause any more damage. So, this is what Israelis are dealing with on a day-to-day basis. There is a culture that is promoting, if not encouraging, this kind of behavior toward Israelis. When your leader says – I'm talking about Palestinian Authority leader Mahmoud Abbas – to get rid of "their filthy feet" from our land, and you have Hamas applauding and having parades in Gaza every time a young Israeli is murdered, there [should] be consequences for them.